Over the years, we have maintained the best state-of-design technology for mobile communications to aid our storm chasing efforts in tracking down the world’s most extreme storms. We still maintain the best state-of-design systems available. This guide will help you learn about storm chasing technology of the past and present. We maintain our own weather modeling servers that are continuously working in the background while we’re storm chasing. Our servers are constantly crunching data to create our own forecasting models custom tailored to the exact severe weather parameters that we want to see. They are also ingesting our own data feeds for the radar software that we use. We obtain the data from satellite connections. Our servers then format the data to our specific needs and allow us to retrieve that data using commercially available software. What this means is that from time to time, public and commercial data feeds crash – especially at times during high severe thunderstorm activity due to the demand and load on public servers. We don’t have this problem since we use our own private servers to get the data we use! As always our technology is state-of-the-art; we have the ability to use a tablet to control, operate and manipulate our servers from anywhere in Tornado Alley! What really sets us apart however is our ability to interpret the data to create the most accurate forecasts! Not every member of our team will physically participate on our storm chasing tours. Our team is often spread out across Tornado Alley and we even have a meteorologist who lives on the west coast. Every member of our team has access to our private servers so we can all easily communicate and collaborate to put together a top-notch forecast, even without having to pick up a phone. Storm Tours van with DataStorm. In the background, the Wakita, OK water tower from “Twister”. A typical chase. however, included making several phone calls either by using a simple Nokia cellular phone or by stopping to use a payphone (which still existed throughout Tornado Alley at the time) to call a dedicated “Now Caster,” a designated person who had access to live weather information and could relay live information to the storm chaser. We also used many other tactics over the years such as stopping at public libraries that had dial-up internet connections, looking for wi-fi hotspots (usually hotels who had unprotected wi-fi networks), or even visiting a National Weather Service office and talking to the meteorologist on-duty about the day’s forecast. 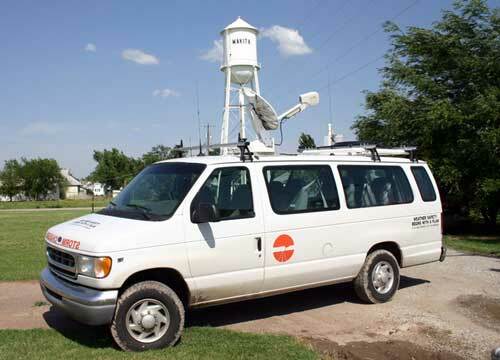 Prior to widespread coverage of mobile cellular networks across the Great Plains, we needed a system to allow us to access the Internet for weather forecasting information, and a way to provide news outlets with high-quality video. The solution was a mobile internet satellite system called “DataStorm.” The DataStorm system would automatically aligned to the proper satellite and provide us with high-speed internet access. Mobile Threat Net in the Storm Chasing Van. There were major drawbacks to this system, however. For one, it took about 15-minutes to get a lock on the satellite. When you’re storm chasing, 15-minutes can seem like hours. Secondly, the slightest amount of wind could break the “lock” it had on the satellite and cause the dish to begin searching again (another 10-15 minutes). Of course, storm chasers are typically in windy areas, so while this system was not ideal, it was much better than what we had before it. 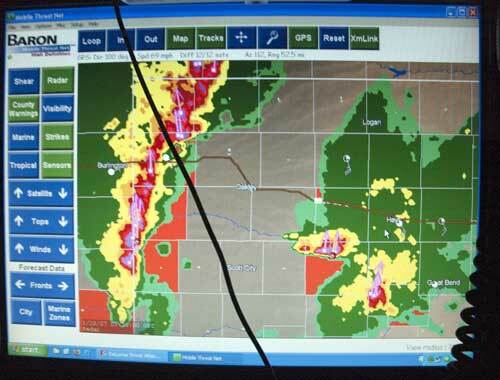 In 2004 storm chasing received its first major mobile communications breakthrough. Baron’s Mobile Threat Net used a tiny XM antenna and receiver to ingest live weather nowcasting information such as radar updates, weather satellite information and live surface observations (wind speed/direction) every 5-minutes and it worked surprisingly well under 60,000 feet of towering cumulus. What was better, is that it worked while the vehicle was in-motion which meant no more need to stop and mess with a large satellite system for radar updates! Once again, there were some drawbacks to this system. In order to compress the datastream to work through XM communications, the radar information was degraded severely. Due to it’s low resolution and the availability of high resolution level II data through applications such as Weather Decision Technologies’ RadarScope, we discontinued the usage of XM weather data in 2013. With AT&T and Verizon rolling out 3G communications throughout the Great Plains, the next big advance in receiving on-the-go information arrived – Level 3 data. This was (and still is) achieved by connecting a laptop computer to a cell phone through a USB or Bluetooth connection, or by using a mobile hotspot device and a software program called GRLevel3. The software runs on a Windows PC and allows the data to be customized in a great number of ways. More advanced users can subscribe to data services for customized data feeds that provide everything from surface observations to live lightning data. Like Mobile Threat Net, the radar data in the Level 3 datastream is still compressed and that, of course, means that there is a loss-of-quality in pixel information. Despite this, it is sufficient enough to get a very clear idea of a storm’s mode. 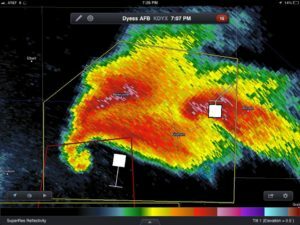 As an example, you can clearly see on the image here that there is a very well defined hook echo on the supercell to the north. This kind of clarity wasn’t available with the Mobile Threat Net system. The latest and greatest (as of the time of this writing in 2015) is Level 2 data. There is a Windows application called GRLevel2, as well as several applications that run on the Linux OS, but the easiest application is called RadarScope and it works directly on the iPad and Android based tablets. Yes, that’s correct – a “tablet” is more efficient than tens of thousands of dollars of large satellite hardware that we’ve used in past years! For starters, the internet connection is built directly into the tablet with 3G/4GLTE connections in most areas. Alternatively, one could use a mobile hotspot with wifi to connect the tablet to the Internet. But the real gem here is the actual quality of the radar data. If you look at the example images that we have provided here, and compare the RadarScope screen grab to the left to the GRLevel3 and Mobile Threat Net images above, not only can you easily determine the hook echo radar signature, but there are a lot more pixels! That’s because this is a Level 2 “Super Resolution” data stream that is simply unmatched by previous software packages. The DataStorm system is still installed and operational on the storm chasing van, however, other than testing to make sure it still works once or twice a year, we don’t use it. It’s there in case of a major disaster that completely “wipes out” the cellular and mobile communication networks of the areas that we’re operating in and that’s about it, it’s our redundancy. We also chase with several laptop computers and still have GRLevel3 and GRLevel2 installed on them. But, we believe the most ideal platform to receive live weather info while on-the-go is quite simply the iPad with a few select apps, such as RadarScope. Since the iPad has it’s own 4GLTE data account, we like to use it to receive radar information while not chewing up or bogging down the bandwidth that we use with our laptop(s). And, since we’re getting the highest quality state-of-the-art data, we’re not sacrificing quality. 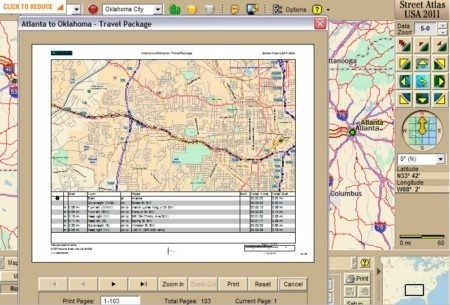 In our van, you will also notice a desktop based computer connected to a touchscreen monitor that we use for a variety of purposes, most commonly to provide us with GPS information and to aid our decision on storm intercept strategy, planning “escape routes” and so on. We also use it to edit video and uplink it to a news network without having to stop. We do have a few pieces of hardware that haven’t changed much over the years that we still use today and both of them are critically important. One is a weather computer that is wirelessly connected to some sensors on the roof of the chase van to provide instant monitoring of critical weather data such as temperature and dew point temperature as well as barometric pressure. We calibrate our weather computer by parking the chase van next to one of the stations that make up the Oklahoma Mesonet for perfect accuracy. Knowing the dew point temperature is of most importance to us and as we’re driving it helps us identify critical boundary areas that will play an important role in the development of severe weather. The other piece of equipment that we use is amateur “ham” radio. First, let us point out that we do not use amateur radio for commercial purposes, nor do we communicate “van to van” on amateur frequencies (we have a business-class commercial radio for van-to-van comms). We will use amateur radio for emergency communications such as when communicating with local Emergency Operation Centers in the areas that we’re in, or when communicating with severe weather “net controllers” who are positioned in areas such as a National Weather Service Warning Forecast Office for reporting severe weather events. 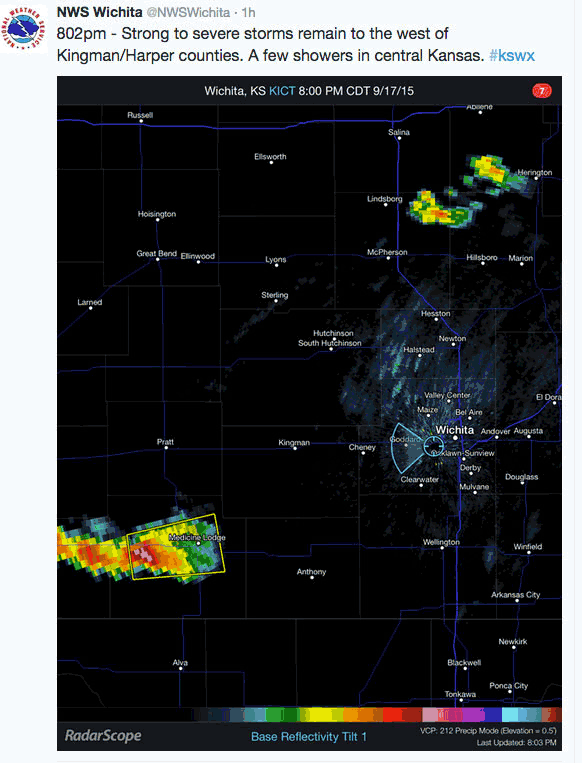 National Weather Service, in Wichita, Kansas using RadarScope (iPad). In the past, it was common to use amateur radio to report severe weather events. Today, there are several other methods of doing so, such as making a report over the Internet. None the less, it is still easier and faster (both are important when dealing with an emergency like a tornado) to just grab the mic, press a button and talk to a person who is in the same room as a warning decision maker. Brian holds a General Class amateur radio license with the call sign “WX0USA”. Today’s mobile technology is better, smarter, faster and smaller than ever before. 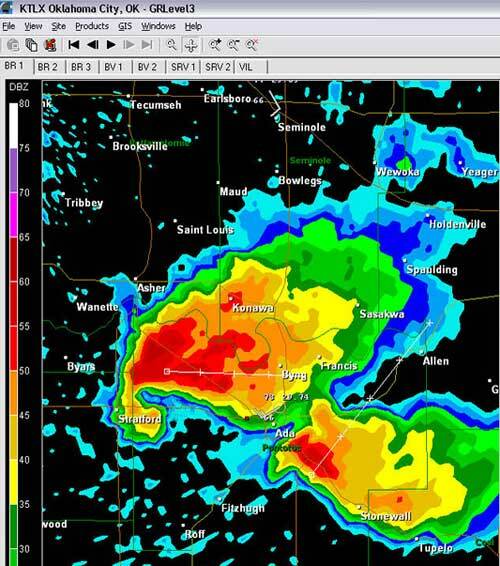 To make a comparison about the quality of data (in terms of “pixels”) that we can receive using RadarScope, in contrast to Mobile Threat Net would be like comparing Pac-Man from 1982 to a modern day 3D video game! The data is better, the device is smaller. With a 4G-LTE tablet, not only do we have the most accurate live weather data at our fingertips, but it’s actually the best radar data available in today’s market. Another advantage is that we can keep it with us while we’re in restaurant (no more running to the van every 6-minutes to check the latest update!) or away from the van in-general. We can also use the built-in web browser to get other types of weather information from the leading meteorological forecasting data websites. A lot of people have expectations of what they might see on a storm chasing trip. Do not expect to see actual mobile radars on the roof of chase vehicles as those days are long over (with the exception of special platform vehicles such as SMART-R and/or DOW vehicles). Do expect to see our storm chasing team using the most advanced mobile technology to help guide our decisions throughout the course of a storm chasing trip. We also have LCD monitors mounted on the ceiling in the van so that we can output our data feed(s) and allow you to see what we see.